How do you know when your community should smoke test, monitor the night flow, pole cam, inspect manholes, investigate sump pumps, or even look for a leak? Here are a few of the most frequently asked questions to help you determine if a leak exists in your sanitary sewer system. 1. What is night flow isolation and how will it benefit my community? Night flow isolations help find leaks within the sanitary sewer system. Flows are monitored between midnight and 5 a.m., when flows should theoretically be at their minimum. A volumetric weir is placed in the pipe, and an instantaneous flow reading is observed. This tool is a good representation of how much unwanted groundwater is entering the system. When the source of the leak is unknown, night flow isolations will determine the area(s) where the groundwater infiltration is occurring. Once the area is narrowed, it is easy to further investigate the problem with other methods like smoke testing or pole camera. 2. Why and when should we perform night flow isolations? If you suspect your system is experiencing inflow/infiltration, a night flow isolation will likely verify the presence of this unwanted flow. Night flow isolations should be performed during or within 24 hours of a large rainfall event, so flow readings will be representative of the amounts of inflow and infiltration in your system. 3. We have a leak in our system; what is the most efficient and cost-effective way to find it? Smoke testing can pinpoint inflow and infiltration sources throughout the sanitary sewer system, as well as provide you with a better plan of attack for eliminating inflow and infiltration. 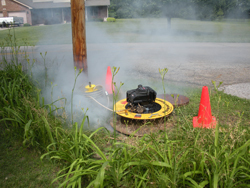 By performing smoke testing in conjunction with manhole inspections in isolated sub-systems, problem areas can be easily identified. 4. What is smoke testing and how will it benefit my community? Smoke testing is a tool used to identify and reduce inflow and infiltration. Smoke testing is one of the quickest and most cost-effective ways for a community to find leaks in their sanitary sewer system. Non-toxic smoke is blown through isolated pipe segments in the sanitary sewer system in order to observe both private and public property defects (i.e. pipe fractures and offset joints, connected downspouts, defective cleanouts, and storm inlets). 5. When is the best time to perform sanitary sewer smoke testing? The warm, dry summer months are the perfect time to perform smoke testing on your sanitary sewers to identify inflow and infiltration. Smoke testing when the ground is dry allows the smoke to easily travel through the voids in the ground so crews can observe defects without obstruction. 6. When is the best time to perform sanitary sewer manhole inspections? Manhole inspections should be performed during the wet season, March through May, when the ground is typically the most saturated; leaking pipes, leaking manhole joints, active clear flow can be observed quickly and more accurately. Having a leak in your sanitary sewer system can be very costly and create serious problems at the wastewater treatment plant. Constantly checking for leaks and maintaining the general health of your sanitary sewer system will prove to be a great benefit for your community in the long run.